This cool season field green has numerous common names such as corn salad, feldsalat, fetticus, lamb's lettuce, mache and nut lettuce. 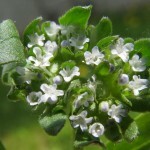 Its small, rounded, somewhat fleshy leaves are produced when weather is cool or even cold. It will even withstand snow. Originally from Eurasia and North Africa, it is a true annual that self-sows freely and has become naturalized in many other countries including parts of the United States. As a green, it is typically eaten in salads and has a fresh, nutty flavor. The plants form tight rosettes of spoon-shaped leaves that are medium to bright green. 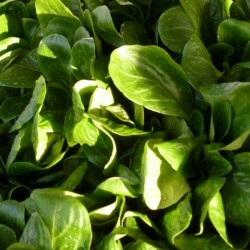 These are very smooth and somewhat fleshy and can be harvested leaf by leaf. As spring weather becomes warmer, each rosette sends up branched stems topped with clusters of small, silvery bluish white flowers. Once the plants begin to flower, they are no longer good to eat. After seed set they die. Germination Sow the seeds directly in the soil, cover lightly and water.